The Departments of Botany and Microbiology organized a guest lecture on the scope and importance of clinical research and cancer biology study on 8th January, 2015. The theme of the programme is explained by Dr. B. Siva Kumari, Department of Botany. Later Mr. Suresh, Research associate from Stanford University delivered a talk on the importance of developing and improving communication skills such as adaptability, presentation skills, team leadership etc. He also encouraged students to be positive and to face boldly any situation. Mr. Suresh stressed on the importance of the scope and importance of clinical trials in clinical research. He clearly explained about ongoing work on clinical trials and oncological research with vivid examples. Unlike traditional training programs, the Cancer Biology program places an emphasis on bridging the gap between laboratory and clinic through a curriculum incorporating both basic science and clinical researchers. In an era where research funding is increasingly focused on the practical applications of scientific findings, it is critically important that students are aware of how scientific discoveries are converted into therapeutic agents. In addition to a comprehensive curriculum focused on pressing problems in cancer research, the Cancer Biology program offers a two-tiered mentoring system that is invaluable to students by giving them actual clinical experience to foster new research ideas that may back-propagate to the laboratory. 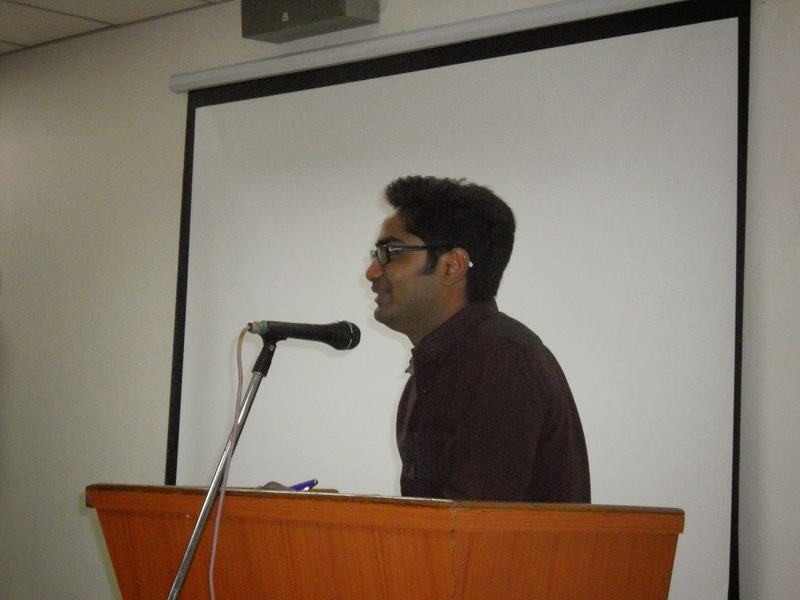 He said that it is important for every student to have an idea and knowledge on managerial skills. Students of III B.Sc Biotechnology, Microbiology and Botany students were involved in this programme. The faculty members Mr. P. Srinivasa Rao, Mr. K Bala Chandra and Ms. Glory coordinated the programme. ‘The contribution of the Students of Andhra Loyola College, coupled with other volunteers around the globe has enabled the Telugu Wikipedia to Cross the mark of 60,000 articles in web as on today’ beamed Mr. Rahmanuddin, the Programme Officer of Centre for Internet and Society (CIS-A2K) based at Bangalore. 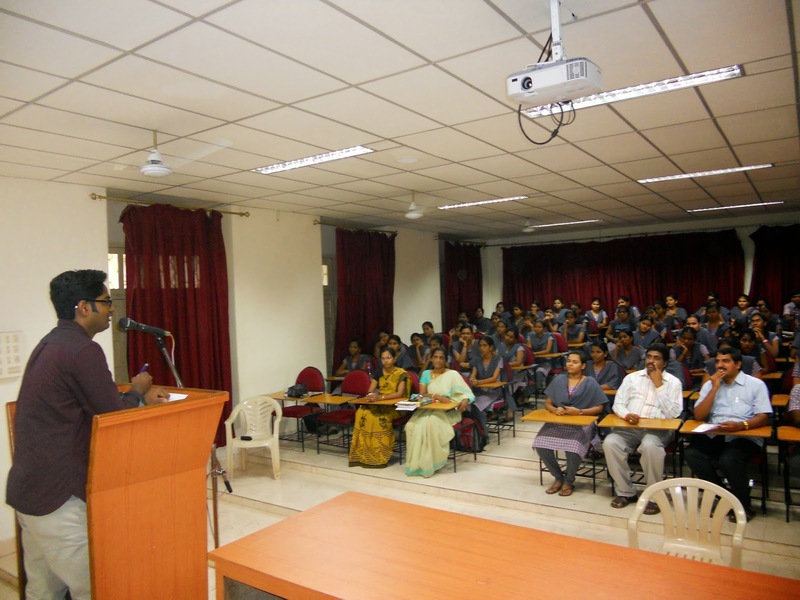 He was addressing the valedictory function of the six day wiki winter camp organized at Andhra Loyola College, in association with CIS-A2K today at the wikipedia lab. During the camp, conducted from 26th to 31st , December 2014, 45 enthusiastic volunteers from B.Sc (Physics) and B.A (Telugu) sections of the College participated . They were trained to be the contributors for Wikipedia and are authorized to add, edit, delete articles in Wikipedia using the validated user ids created during the camp. At the end of the camp, the student volunteers have, contributed 108 articles in Physics into Telugu Wikipedia. The Students of Special Telugu have digitized the classical works of Kandukuri Veerasalingam. His works are digitalized and are now available as open access contents, for those who search his works around the world. These articles are scrutinized by experts from other parts of the world and are accepted on permanent basis. Sri. Kola Sekhar, of Department of Telugu, the Organizing Secretary for Telugu subject said that Kandukuri Veerasalingam, a well known Social Activist and Writer, whose works reflected the social evils prevailed in his era are still relevant today. The solutions Veerasalingam showed through his works are not available to current generation. This Camp aims at bringing those works on-line, and thus continue to inspire many generations to come. Sri Sekhar said that he would strive hard to add more and more classical works in Telugu to the wikipedia so that they are available forever to the Telugu lovers. Dr. Sahaya Baskaran, the Organizing secretary for Physics subject said that learning through ones own mother tongue is the right way to understand the sciences deeply. He said that most of the science students learn the subject by-heart and miss the real understanding of the subject. In this given scenario, adding the concepts of Physics in Telugu and making them available in the internet would enhance the interest in sciences and pave a way for the development of Science, especially to the Telugu Students, who study through English medium. ‘As the net access is exponentially increasing, more and more digital contents in Telugu should come and thus the growth of language would be ensured’ he felt. 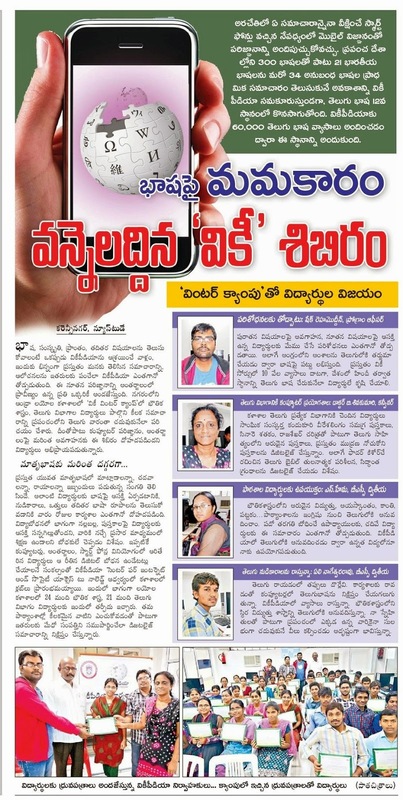 The student volunteers felt that the training to write their own articles in Physics, helped them to improve their knowledge in Physics besides improving their vocabulary in Telugu. Roy Kumar, II B.A Volunteer, said that he has learnt more about Kandukuri Veerasalingam and feels that the camp has helped me to serve his mother-tongue, even if it is in a small way. Dr. Siva Kumari, Convener thanked the Management for their infrastructural support and the students and the staff of Computer Centre Mr Lakshman for their voluntary participation in the camp.